A high court in Ilorin, Kwara State, presided over by Justice T.S. Umar on Tuesday restrained the Kwara State House of Assembly from suspending a member representing Balogun/Ojomu constituency of Offa in Offa Local Government Area of the State, Mr. Saheed Popoola. 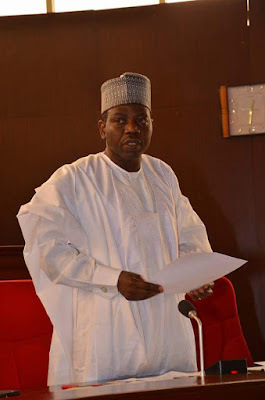 Popoola is the only state lawmaker of the All Progressives Congress who did not defect with the Speaker, Dr. Ali Ahmad, and 22 other members of the House. The lawmakers had left APC for Peoples Democratic Party after Senate President Bukola Saraki, other members of the National Assembly from the state, Governor Abdulfatah Ahmed and their loyalists did the same. It was learnt that the Assembly had commenced a process to investigate allegations of certificate and forgery allegations preferred against Popoola. It was alleged that some members had threatened to suspend him. Popoola consequently sued the Assembly, the Speaker and other members of the House. Culled from Punch.